Republicans won control of the North Carolina legislature in 2010 for the first time in a century, and captured the governor’s mansion last year. They haven’t been shy about pursuing an extremely conservative agenda in what’s become a critical battleground state that has a fast growing liberal population in Charlotte and Raleigh. They’ve passed the most regressive voter ID law in the nation, pushed new regulations on abortion clinics, rejected a federally-funded expansion of Medicaid for the state’s 500,000+ poor, severely cut unemployment insurance despite the state’s 9% unemployment rate which is fourth or fifth highest in the nation, on and on. Polling from late June found that the state party was too far to the right even for the state’s Republican voters. Voters overall opposed two competing budgets 49-19 and 50-17, opposed a consumer finance interest rate hike 68-2, a plan to allow guns in schools 66-21, and freshman governor Pat McCrory’s job approval rating plummeted from by 20 points between January and June. Since then, things have gotten significantly worse for Republicans here. 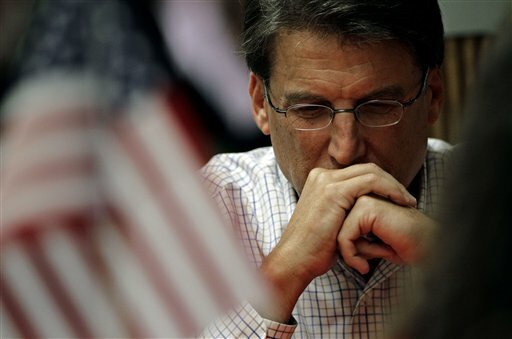 McCrory’s approval rating has fallen from 45-39 to 35-53 just in the past two months. If he were up for reelection next year (he’s not), McCrory would be the fourth most unpopular governor in the United States out of 25 facing reelection. The biggest drop has come from independents, from 41-49 approval to 32-57. * The GOP-dominated state legislature job approval is even worse, down to just 24%. * 79% of voters have a big problem with McCrory setting up his 2012 campaign staff with very high paying jobs ($80,000+) within the government, despite promising not to do so during the 2012 campaign. * Pat McCrory is trailing four Democrats in hypothetical match-ups for (I guess) 2016, including popular state Attorney General Roy Cooper, who finally looks like he’s ready to make a run at the governor’s mansion. Most of the Dems have poor name recognition which means McCrory trailing them is actually far worse than it seems at first glance. * Democrats are leading the generic ballot 48-41 in September. The generic ballot question asks something along the lines of “If an election were held today, would you vote for a Republican or a Democrat to represent you in the legislature?“. If an election were held this month, that would normally mean that Democrats would easily resume majority control of the legislature. But the state GOP aggressively redrew district lines after the 2010 census and a 48-41 generic ballot lead could mean anything from a narrow Republican majority to a narrow Democratic majority, again, if an election were held today. * PPP specifically asked voters if “GOP control” has been “bad” or “good” for North Carolina. 36% said it has been good, while 54% have said it’s been bad. * There is wide support for increasing the minimum wage in North Carolina to $10 an hour. 61% support it overall, split between Dems/Indys/Reps being 79%/59%/37%. This should be a really controversial bit of news. If you reset the district lines to pre-2010 and then hold an election today, Republicans would go from controlling the entire state government to losing everything. If you keep the new district lines drawn by the new GOP majority, Democrats would easily take back the governor’s mansion but possibly fall short of getting the legislature back because of gerrymandering. This country really has to do something about gerrymandering. We can’t allow democracy to be subverted like this, where a decent majority of citizens in North Carolina want to throw the GOP out onto the street after just two years, but can’t because that very same GOP redrew district lines that made it virtually impossible for Democrats to win. The GOP obsession with (non-existent) voter fraud is nothing in comparison to the way the GOP has undermined democracy in America at the state level in the past four years.